Ann Douglas will be speaking about her latest book, Happy Parents Happy Kids. Ann will be speaking about her new book, Happy Parents, Happy Kids, which is about thriving as a family. • how to zero in on the most effective parenting strategies (parenting strategies that work for parents and kids as opposed to parents or kids). Ann Douglas will be speaking about Big-Picture Parenting — parenting with your hopes and dreams for your family in mind. This kind and supportive presentation emphasizes self-compassion, self-care, and parenting strategies that work for parents and kids. Ann will be speaking about her new book, Happy Parents, Happy Kids. Ann Douglas will be delivering a presentation based on her latest book Happy Parents, Happy Kids. Ann will be speaking about Parenting Through the Storm at this annual conference for parents, guardians, and relatives who are troubled by the behaviours of a teen or young adult. Please register for this event via HOPE (“Helping Other Parents Everywhere”). See additional details in the brochure for this event. Ann will be delivering the keynote address at this conference for professionals working in the field of family support. Her presentation is entitled “Journeying Together: The How and Why of Family Engagement.” Please contact the host organization for conference details and registration. Ann Douglas will be speaking about wellness and coping strategies for parents and kids — the focus of her new book, Happy Parents Happy Kids. Ann Douglas will be speaking about Parenting Through the Storm and Happy Parents, Happy Kids at this mental health conference hosted by the Ontario Shores Centre for Mental Health Services. Ann Douglas will be speaking about Happy Parents Happy Kids: parenting strategies that work for parents and kids and thriving as a family. This is the first of two sessions. (See details on flyer below.) This event is free and open to any parent in the GTA, but pre-registration is required. Ann will be speaking about Parenting Through the Storm. Presentation description: “Having a child who is struggling doesn’t make you a bad parent, just as being a child who is struggling doesn’t make your child a bad kid.” That’s a powerful and reassuring message to hear if you happen to be the parent of a child who is struggling with anxiety, depression, ADHD, an autism spectrum disorder, or a related challenge. In this encouraging and story-rich workshop, Ann Douglas shares some of her own hard-won wisdom about thriving as a family while weathering one of life’s many storms (the focus of her recent book Parenting Through the Storm). The workshop is based on interviews with more than 50 parents who have walked this walk and who are eager to share their best advice with other parents. Expect a workshop that is kind, encouraging, and real and that leaves you feeling anything but alone. Ann will be speaking about Parenting Through the Storm. Presentation description: “Having a child who is struggling doesn’t make you a bad parent, just as being a child who is struggling doesn’t make your child a bad kid.” That’s a powerful and reassuring message to hear if you happen to be the parent of a child who is struggling with anxiety, depression, ADHD, an autism spectrum disorder, or a related challenge. In this encouraging and story-rich workshop, Ann Douglas shares some of her own hard-won wisdom about thriving as a family while weathering one of life’s many storms (the focus of her recent book Parenting Through the Storm). The workshop is based on interviews with more than 50 parents who have walked this walk and who are eager to share their best advice with other parents. Expect a workshop that is kind, encouraging, and real and that leaves you feeling anything but alone. Join Ann and Amanda for an in-depth conversation about the intersection of parenthood and mental health and how we can support each other as parents, colleagues, and neighbours. This is a free event, but tickets are limited and pre-registration is required. *Please note this event is scheduled at a family-friendly time, will include snacks and non-alcoholic beverages. Childcare is available for this event. Please email hello@theworkaround.ca to reserve your spot. Happy Parents, Happy Kids and Day Nine: a postpartum depression memoir will be available for purchase at this event, and there will be an opportunity for book signing after the Q&A with Ann and Amanda. Ann Douglas is a bestselling parenting author and the weekend parenting columnist for CBC Radio. She is the creator of The Mother of All Book series and the author of Parenting Through the Storm. In February 2019, HarperCollins Canada published her latest book, Happy Parents, Happy Kids. Amanda Munday is the sole owner and founder of The Workaround, a coworking space with childcare in Toronto. She is a skilled storyteller with years of experience growing companies through social media, traditional marketing and public relations. Her first memoir Day Nine details her experience of severe postpartum depression which culminated in an 18-day involuntary stay in a Toronto psychiatric ward. Amanda has received international media coverage including being named an inspirational speaker in Forbes Magazine. She is also a regular contributor to the Globe and Mail on topics related to economic opportunities for women and universal childcare. In November 2017 she secured a federal petition on universal childcare which was tabled in the House of Commons. Ann Douglas will be talking about parenting in an age of anxiety and raising resilient children. See event details below. Ann Douglas will be speaking about Happy Parents Happy Kids. The presentation will focus on mental wellness and coping strategies for parents and kids (parent and child resilience and coping skills in the context of healthy child/adolescent development). Ann Douglas will be speaking about Social Media Smarts: Tech Strategies that Work for Parents and Teens. Presentation description: Social Media Smarts: Tech Strategies that Work for Parents and Teens. • Strategies for making more conscious and deliberate decisions about the use of technology plus highlights from the science of habit change on how to make those changes stick. Presentation description: “Having a child who is struggling doesn’t make you a bad parent, just as being a child who is struggling doesn’t make your child a bad kid.” That’s a powerful and reassuring message to hear if you happen to be the parent of a child who is struggling with anxiety, depression, ADHD, an autism spectrum disorder, or a related challenge. In this encouraging and story-rich presentation, Ann Douglas shares some of her own hard-won wisdom about thriving as a family while weathering one of life’s many storms (the focus of her book Parenting Through the Storm). The presentation is based on interviews with more than 50 parents who have walked this walk and who are eager to share their best advice with other parents. Expect a conversation that is kind, encouraging, and real and that leaves you feeling anything but alone. Ann Douglas will be speaking on Parenting in An Age of Anxiety. For conference registration details, please contact the Canadian Premature Babies Foundation. Ann Douglas will be speaking about her new book, Happy Parents, Happy Kids, at this popular Toronto pregnancy and parenting show. Please note: Due to space constraints, this event is limited to members of the Lorne Park Public School Community only. All kids experience stress and anxiety. These emotions are part of being human, after all. But one in eight children experiences such a high level of anxiety that the child finds it difficult to manage at home or at school. In this thought-provoking presentation by Ann Douglas (a bestselling parent author who also struggles with anxiety), you’ll learn how to tell the difference between stress and anxiety (and why this matters); stress management skills for kids and adults; and anxiety management skills for kids and adults (what makes anxiety better, not worse). This presentation is based on strategies outlined in Ann’s two most recent books, Happy Parents Happy Kids and Parenting Through the Storm. Ann Douglas will be participating in a panel on “Adulthood: Family Experiences of Resiliency” at the Vanier Institute of the Family’s Families in Canada Conference. Ann will be participating in North Hastings Children’s Services’ March Break Event at the Bancroft Legion (from 11 am to 2 pm). Additional details to follow via the North Hastings Children’s Services events page. Drop by Ann’s booth to add a parenting tip to her “wall of parenting wisdom” and you’ll be entered in a draw to win a copy of her latest book, Happy Parents Happy Kids. ECE Retreat in Kelowna, BC: "Calm, Caring, and Connected"
Ann Douglas will be presenting two workshops — The Umbrella Workshop: Helping Families to Weather the Storm and Let’s Start a Self-Care Revolution at this conference for early childhood educators. Conference description: The ECE Retreat Kelowna: Calm, Caring & Connected is being held March 9, 2019 at Reid Hall which is located at 2279 Benvoulin Rd. in Kelowna, British Columbia. The event will be held between 9:15 AM and 4:30 PM. All who register, attend and participate in the full ECE Retreat will receive a 6 hour professional development certificate. The theme of this ECE Retreat is “Calm, Caring & Connected.” Child care in BC has been undergoing a significant amount of change over the last year. While it has been an exciting time on many levels — the reality is that it has also been a stressful time for educators, operators and families. Throughout the Calm, Caring & Connected theme of this ECE Retreat, we will explore a number of areas designed to address the concepts related to caring for yourself, caring for others and caring for the important work that we do in the field of early learning and child care. This ECE Retreat will include a combination of masterminds, workshop presentations and engaging “wisdom from the room” discussions. We have brought together a group of fantastic presenters that we believe the early childhood education community/child care will benefit greatly from interacting with. Full registration details here. 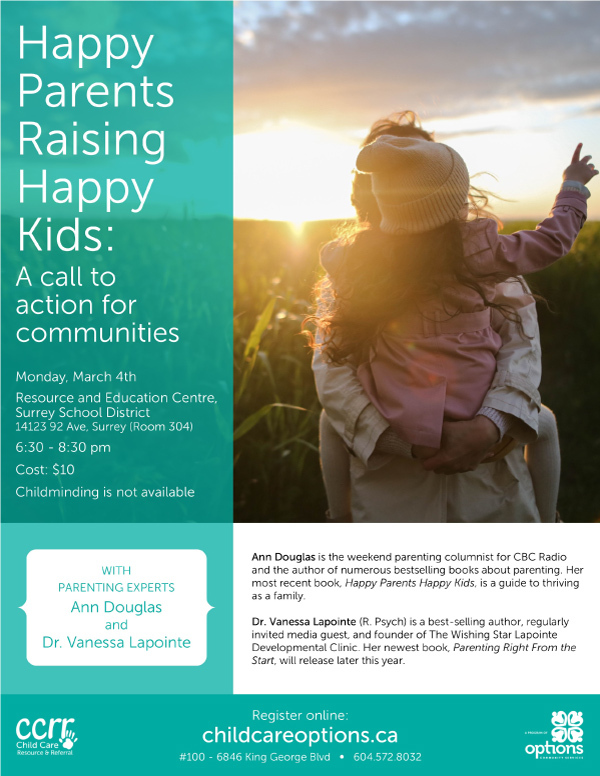 Ann Douglas will be speaking on “Happy Parents Raising Happy Kids: A Call to Action for Communities” — a community conversation hosted by psychologist and author Dr. Vanessa Lapointe. Register online via childcare options.ca. For children to grow in the best possible way, they need to exist in an environment that works for them. That environment is created primarily by parents. This means that parents need to be at their best in order for kids to get what they need. As it turns out “the village” has a significant role to play in ensuring this is the case. At this special community event, celebrated parenting educator Ann Douglas and Registered Psychologist Dr. Vanessa Lapointe present a personal and up-front perspective of the role of community in the raising of children. Drawing from key areas of research and Ann’s work for her latest book where she interviewed dozens of Canadian parents, a path forward will be presented, with solutions that can be tackled at the individual, family, and community level. Ann Douglas is a bestselling parenting author and the weekend parenting columnist for CBC Radio. She is the creator of The Mother of All Book series and the author of Parenting Through the Storm. In February 2019, HarperCollins Canada will publish her latest book, Happy Parents, Happy Kids. A passionate and inspiring speaker, Ann delivers keynote addresses and leads small-group workshops at health, parenting, and education conferences across the country. She also hosts online conversations about parenting and mental health (for Understood.org's highly popular #LDchat and Children's Mental Health Ontario #kidscantwait mental health advocacy campaign). Ann is an active volunteer and frequent commentator on all things parenting. She has received awards for both her writing and her volunteer work. In June 2013, she became the second person to be awarded a Lifetime Membership by the Professional Writers Association of Canada (in recognition of her contributions to the freelance writing profession). And in April 2012, she was one of 16 Canadians invited to Rideau Hall to discuss family policy with Canadian Governor-General David Johnston and his wife Sharon Johnston. Dr. Vanessa Lapointe is an author, parenting expert, and registered psychologist (British Columbia #1856) who has been supporting families and children for more than fifteen years. Author of Discipline without Damage: How to get your kids to behave without messing them up and Parenting Right From The Start: Laying a Healthy Foundation in the Baby and Toddler Years, regularly invited media guest and contributor, educator and speaker, a Huffington Post Parent blogger, and a consultant to research projects and various organizations promoting emotional health and development, Dr. Vanessa is known for bringing a sense of nurturing understanding and humanity to all of her work. She presently works in private practice and has previous experience in a variety of settings, including the British Columbia Ministry of Children and Family Development and the school system. Dr. Vanessa’s passion is in walking alongside parents, teachers, care providers, and other big people to really see the world through the child’s eyes. She believes that if we can do this, we are beautifully positioned to grow up our children in the best possible way. As a mother to 2 growing children, Dr. Vanessa strives not only professionally, but also personally, to view the world through the child’s eyes. Ann Douglas will be delivering a keynote address and offering a small-group workshop at this popular parenting conference for parents in BC. You can register via the Vancouver Island Parent Conference website. “Having a child who is struggling doesn’t make you a bad parent, just as being a child who is struggling doesn’t make your child a bad kid.” That’s a powerful and reassuring message to hear if you happen to be the parent of a child who is struggling with anxiety, depression, ADHD, an autism spectrum disorder, or a related challenge. In this encouraging and story-rich workshop, Ann Douglas shares some of her own hard-won wisdom about thriving as a family while weathering one of life’s many storms (the focus of her book Parenting Through the Storm). The workshop is based on interviews with more than 50 parents who have walked this walk and who are eager to share their best advice with other parents. Expect a workshop that is kind, encouraging, and real and that leaves you feeling anything but alone. Ann will be delivering "The Umbrella Workshop: Helping Families to Weather the Storm" at the Best Start Ontario Conference -- a conference for service providers who work in preconception health, prenatal health and early child development. • What the science of behavioural change can teach us about supporting parents through the process of becoming happier and healthier alongside their kids—and in ways that actually work in the real world. During this session, you’ll be guided through the process of creating a family engagement mini-plan (your chance to capture and build upon the key ideas raised in this workshop). You’ll also have an opportunity to swap strategies and share best practices with colleagues. Ann Douglas will be speaking about Parenting in an Age of Anxiety: A Stress and Anxiety Toolkit for Parents at this school event. “The Truth About Teenagers: What Every Parent Needs to Know.” This informative and encouraging presentation focuses on adolescent development (how understanding adolescent development can make you a better parent), parenting strategies (the three things teenagers need most from their parents), and the job description for the job of teenager (the four “key developmental tasks” of adolescence). It explains why the teen years can be such a challenging time for both parents and teens alike — and how parents can respond that challenge in a way that strengthens, not weakens, their connection to their teen. Ann Douglas will be moderating the parent panel at the Children’s Mental Health Ontario Annual Conference. Children’s Mental Health Ontario is the association representing Ontario’s publicly-funded child and youth mental health centres. “The Truth About Teenagers: What Every Parent Needs to Know.” This informative and encouraging presentation focuses on adolescent development (how understanding adolescent development can make you a better parent), parenting strategies (the three things teenagers need most from their parents), and the job description for the job of teenager (the four “key developmental tasks” of adolescence). It explains why the teen years can be such a challenging time for both parents and teens alike — and how parents can respond that challenge in a way that strengthens, not weakens, their connection to their teen. It also discusses the important role that parents can play in supporting adolescent mental health throughout the teen years and beyond—and what that means in practical terms (how parents can apply this information to their everyday lives, starting right now). Struggling to get that book out of your head and on to the page? This workshop is for you! How to manage the emotional highs and lows that are baked into the experience of becoming an author. A dream of becoming an author. Everything else will be supplied (including worksheets and resource lists). Ann Douglas will be delivering the opening keynote at this annual conference for members of Ontario’s publicly-funded child development and rehabilitation sector (Supporting Parents Through the Storm). She will also be hosting an intimate, small-group discussion for parents attending the conference. Ann Douglas will be delivering The Mother of All Toddler Workshops at this conference for Toronto-area parents. For registration, please contact Life With A Baby. Wondering what it takes to bring out the best (as opposed to the worst) in your toddler? Looking for some parent-proven strategies for managing even the most challenging toddler behaviours? Join bestselling parenting author Ann Douglas for a guided tour of the rollercoaster ride that is the toddler years. • How to maintain your loving connection to your toddler while supporting your toddler’s increased need for independence at the same time. This intimate and information-packed workshop summarizes the latest research on what actually encourages toddlers to thrive. - How to maintain your loving connection to your toddler while supporting your toddler’s increased need for independence at the same time. This intimate and information-packed workshop summarizes the latest research on what actually encourages toddlers to thrive. And, as an added bonus, your ticket includes a signed copy of the second edition of The Mother of All Toddler Books. This workshop is being hosted by Hello, Baby! (a doula service and prenatal education company in Peterborough, Ontario). Ann Douglas will be speaking about "Parenting Through the Storm." PARENTING THROUGH THE STORM: Parents can make a difference when it comes to children’s mental health. That’s a powerful and reassuring message if you’re a parent and you’ve been alarmed by recent newspaper headlines about anxiety, depression, and other mental health difficulties in children and adolescents. In this practical and idea-packed workshop, parenting author Ann Douglas will share some highlights from her latest book Parenting Through the Storm: How to Handle The Highs, The Lows, and Everything In-Between — a book for parents who have a child who is struggling with a mental health, neurodevelopmental, or behavioural challenge. The workshop focuses on parenting strategies, advocacy skills, and stress management and coping skills. Topics to be discussed include self-care, self-compassion, creating your own support network, and lifestyle matters (nutrition, fitness, sleep, and making time for fun). This presentation is based on interviews with more than 50 parents who have walked this walk and who are eager to share their best advice with other parents. Ann Douglas will be hosting "Toddler Trivia" at The Baby Show at Exhibition Place at 1 pm Saturday and 1 pm Sunday. It's your chance to test your knowledge of all things toddler -- and maybe walk away with a signed copy of the newly updated The Mother of All Toddler Books. More about the show here. Ann Douglas will be presenting "The Umbrella Workshop: Helping Families to Weather the Storm" -- a workshop for first responders supporting families in crisis. The workshop will emphasize strategies for supporting parents and other family members when a family member is in crisis (how to make a real difference for that family — and in a potentially life-changing way) and important messages families need to hear from their community, when those families are in the midst of weathering a storm. Ann Douglas will be speaking about "Parenting in an Age of Anxiety: A Stress and Anxiety Toolkit for Parents." Ann Douglas will be speaking about the advantages of taking a big-picture approach to parenting: parenting with your hopes and dreams for your child and your family in mind. She will discuss the importance of tuning into your child’s needs, using parenting strategies that bring out the best (as opposed to the worst) in your child, being mindful of your parenting decisions, creating a support network for yourself and your family, and practicing self-care. Expect a compelling mix of practical advice and lively anecdotes from this popular and engaging speaker.